The Qualcomm Snapdragon 712 (SD712) is a fast mid-range ARM-based SoC largely found on Android tablets and smartphones. Compared to the Snapdragon 710 predecessor, the 712 offers a 10% faster CPU and GPU due to clock rate increases (100 MHz for the CPU e.g.). It was announced early 2019 and positions itself between the 600 series (e.g. Snapdragon 660) and 800 series (e.g. Snapdragon 845). It integrates 8 Kryo 360 cores devided in two big cores (most likely based on Cortex-A75 at up to 2.3 GHz) and six small cores (most likely based on Coretx-A55 at up to 1.7 or 1.8 GHz). The memory controller supports LPDDR4X and the integrated graphics card is called Adreno 616. The X15 LTE modem supports 4x4 MIMO with up to 800 MBbit/s download and 150 MBit/s upload. The Snapdragon 712 is manufactured in the modern 10 nm process at Samsung (10LPP). 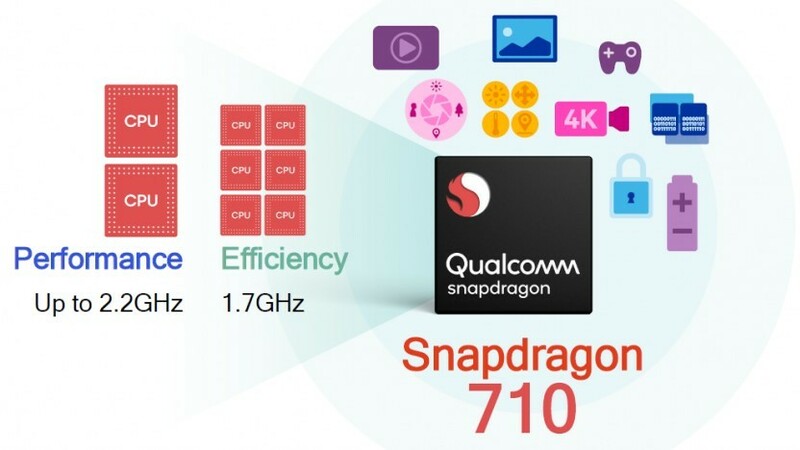 The Qualcomm Snapdragon 710 (SD710) is a fast mid-range ARM-based SoC largely found on Android tablets and smartphones. Announced in early 2018, the SD710 is the first of the 700 series and positions itself between the 600 series (e.g. Snapdragon 660) and 800 series (e.g. Snapdragon 845). It integrates 8 Kryo 360 cores devided in two big cores (most likely based on Cortex-A75 at up to 2.2 GHz) and six small cores (most likely based on Coretx-A55 at up to 1.7 GHz). The memory controller supports LPDDR4X and the integrated graphics card is called Adreno 616. The X15 LTE modem supports 4x4 MIMO with up to 800 MBbit/s download and 150 MBit/s upload. Compared to the older Snapdragon 660, Qualcomm advertises the CPU clusters to be up to 20% faster and the GPU up to 35 %. The Snapdragon 710 is manufactured in the modern 10 nm process at Samsung (10LPP).